I was awake at 4 a.m., too excited to sleep. (My “don’t worry I don’t snore” snoring roommate didn’t help.) I laid in bed for two hours trying to coax my body back into slumber and then listening to music on my iphone until it was a respectable hour to get up and walk. At 6 a.m., I couldn’t wait any longer. I quietly and mostly in the dark, so as not to wake my roommate, got dressed and packed my backpack. By 6:45, I was ready to go. Dawn was just beginning to light the blue-black sky. The moon was bright, only a couple days past full, and a few stars were visible as I set out. I walked in silence until it was light enough that I didn’t feel I needed all my senses for safety. Then I popped in the earbuds and put my Prince collection on shuffle. 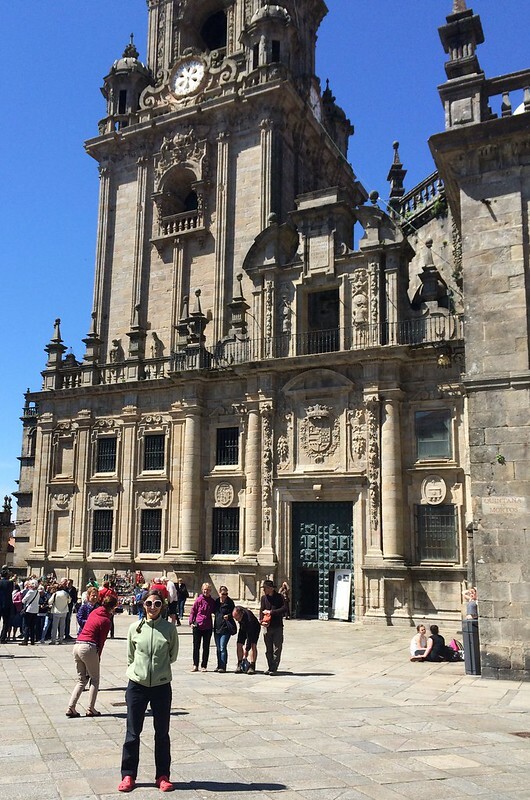 I had 29 kilometers (about 18 miles) to go to Santiago de Compostela. I was hoping to get there in time for the Pilgrim’s Mass at noon in the cathedral. I had to push to make it and I knew the music would give me a little extra speed. For the last few days, the number of pilgrims on the trail had increased significantly. 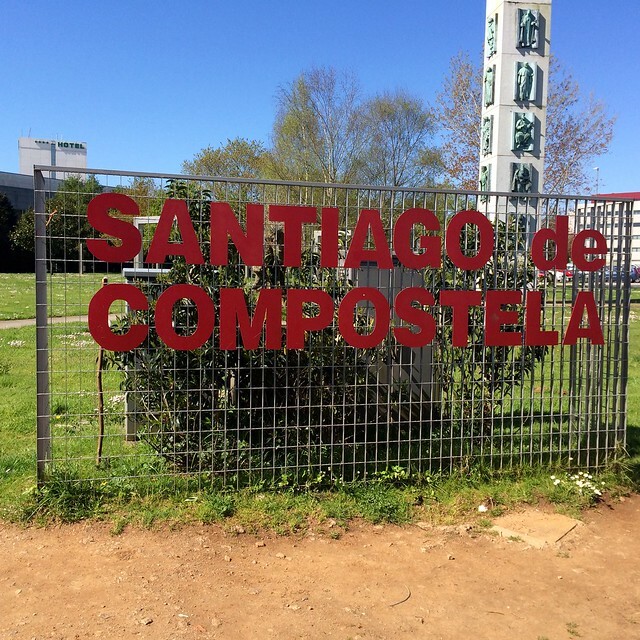 Many started in Sarria, the last major town before the 100-kilometer mark, the distance required to receive your Compostela in Santiago. Another long-distance pilgrim from Denmark had labeled them “tourist pilgrims.” But this morning, there were no pilgrims in sight for the first two hours, a welcome change. 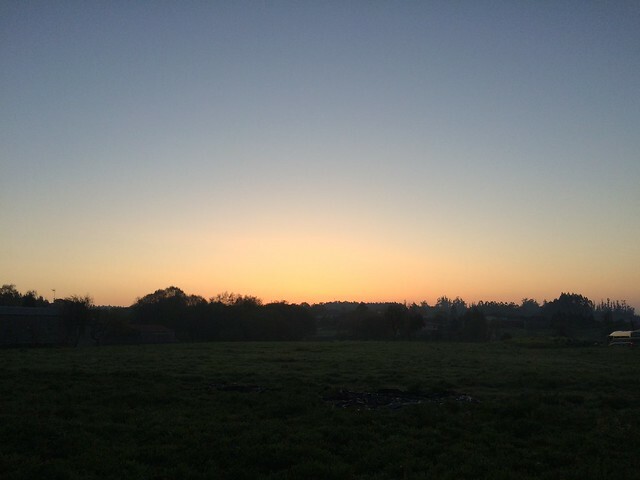 The sun shone brightly in the cloudless sky, the first such sky in a month of walking. I relished the warmth and the light, walking in just my t-shirt for only the second time in 29 days. I thought that my mind would be full, processing the last four weeks, my long journey from France. But it was surprisingly easy to turn it off, let the music envelope me and just walk. And walk. And walk. 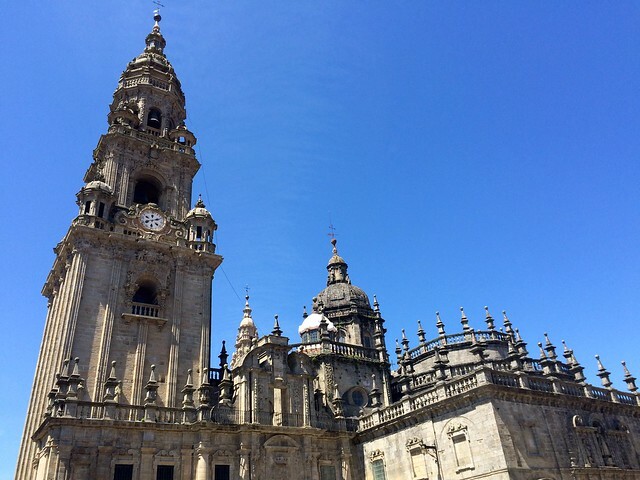 That last 29 km felt like 100, especially the last two after I entered the city of Santiago and wound my way towards the Cathedral. I caught a glimpse of one of the Cathedral towers from blocks away between the tall city buildings. I let out a little laugh and a huge grin spread across my face. By this time, it was just after noon and I sped up a little. I was so close. I made it there by 12:15, and luckily it only took me a few minutes to stash my backpack at the luggage office across the plaza. 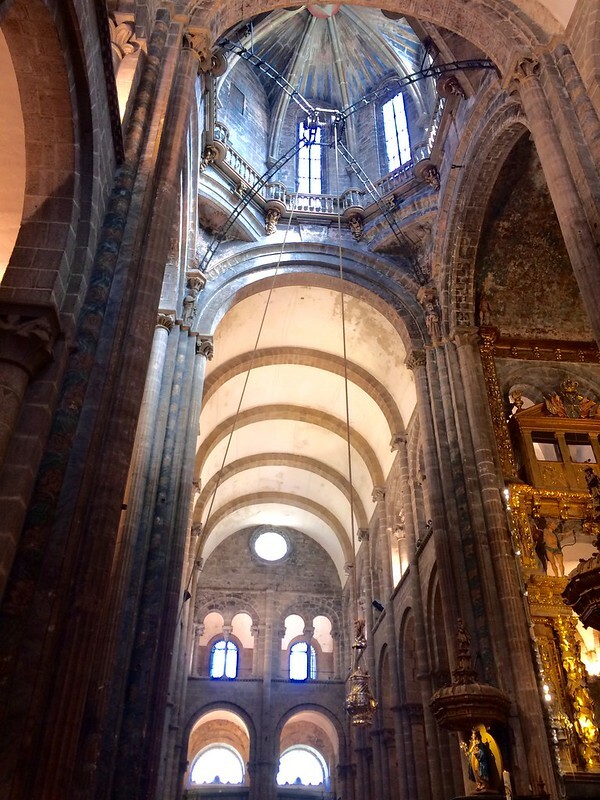 I entered the Cathedral to a crush of people, the most people I had been in contact with in weeks. An older man I had walked with the last few hundred meters was waiting in a large line, but said he didn’t know what the line was for. I investigated and determined that the line was to enter the large, gilted crypt of St. James. So we exited the line and walked past it to the nave where the mass was still in progress. 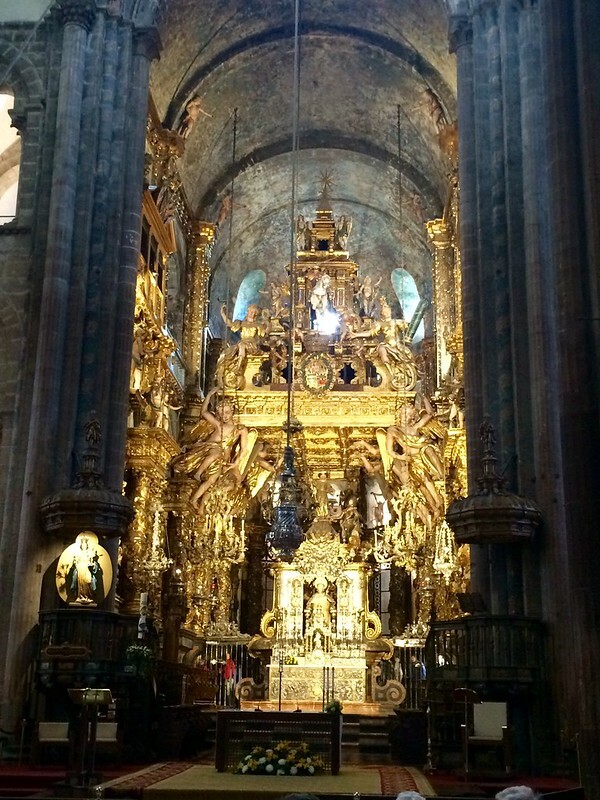 The Botafumeiro, the world’s largest incense burner, which historically was used to fumigate and cover the smell of the unwashed pilgrims, hung from the center dome, just above and in front of the priests. Any and all available seats were full; people stood five or more deep surrounding the pews. I noticed a security guard letting some people with pilgrim credentials through the ropes to get closer. I showed mine and did the same. My feet and legs were aching, so I took the only seat I could find on the stone base of a huge pillar. This blocked my view of the priests and altar, but I didn’t care. I sat down and started to cry. 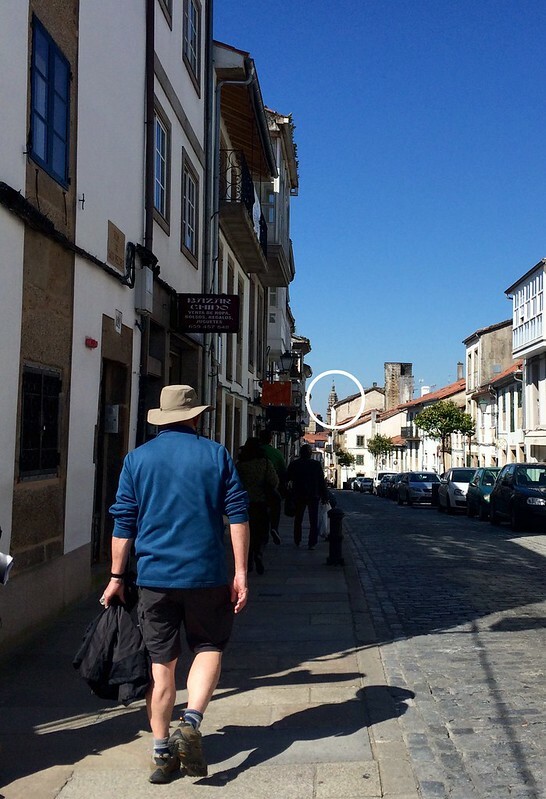 I was actually surprised by how little emotion I felt entering the city, which is when I realized that, for me, this pilgrimage was about the journey, more than the destination. But once I rested at the base of that pillar, I was overcome with emotion, with gratitude, with joy. After communion was given, I noticed that the priests had moved the podium back, and there was a lot of chattering among the crowd. I got excited. 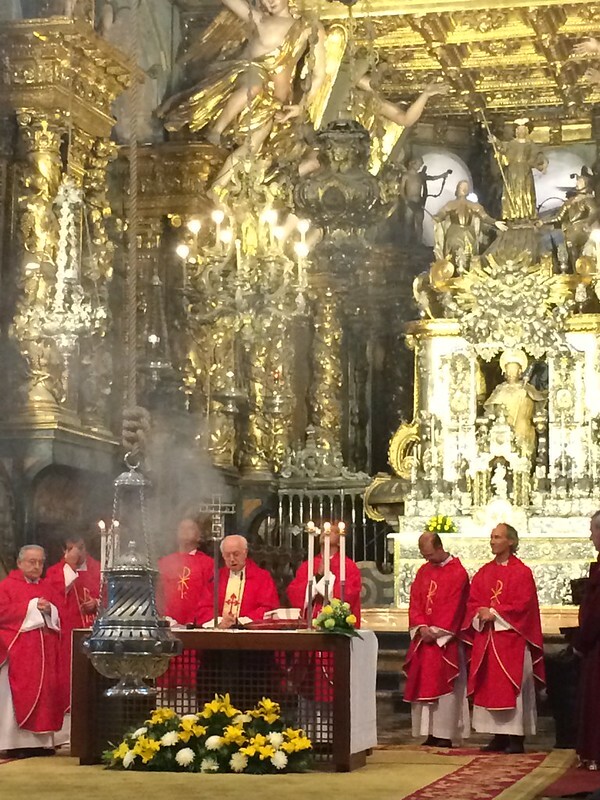 The Botafumeiro isn’t used everyday any more, primarily on holy days or if a large enough donation is made. Six men in dark robes, walked to the center of the nave, holding a large rope with six smaller ropes dangling from it. The Botafumeiro began to smoke and they began to yank the rope with their whole body, up and down, up and down, as the Botafumeiro began to swing, only slightly at first and then higher and higher, until it was nearly horizontal at either end of its arc. It was definitely one of the coolest things I’ve ever seen inside a church! The crowd was electric with excitement. One of the priests even had his smartphone out taking a video. After the mass, I went back out into the bright sunshine-y day. I saw a few other pilgrims I had met along the way, including Jeff from Milwaukie who enveloped me in a big bear hug. 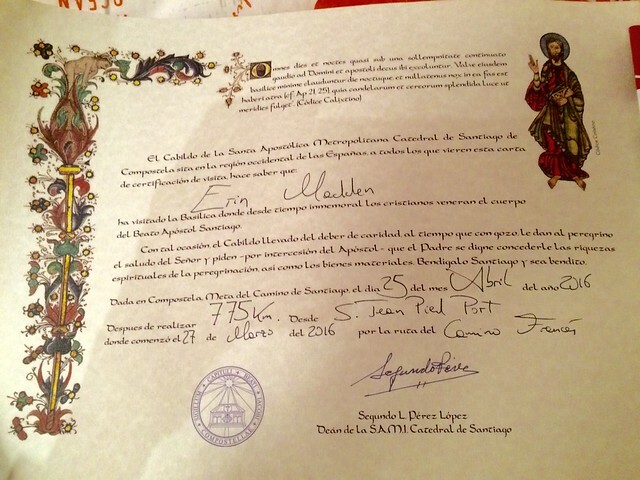 Finally, I made my way to the Pilgrim’s Office to get my Compostela, the certificate of completion of my journey. It is beautiful and a lovely commemoration of my accomplishment, but it pales in comparison to the beautiful people I have met and country I have just crossed. After a rest day in Santiago, my journey will actually continue the final 90 km to Finesterre (“end of the earth”) at the coast where Alex will join me. I look forward to those final three days, the time to process this experience before re-entering “the real world.” And I can’t wait to sit on the beach and watch the sun go down over the Atlantic. Today I walked 18 miles. Congratulations Erin. 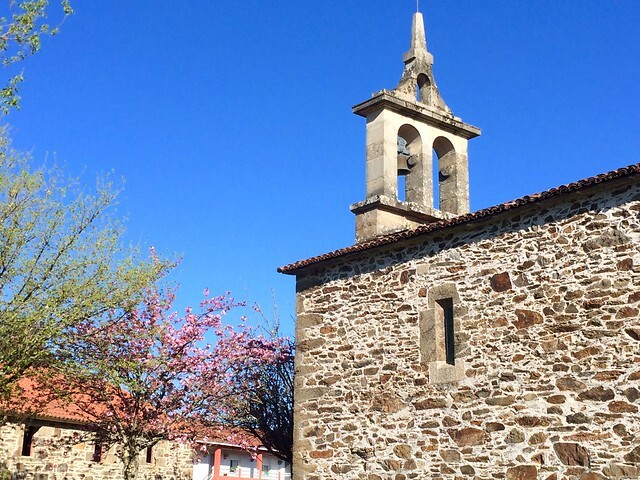 I’m sad not to have arrived in Santiago, but thanks to your lucid, precise and precious words I could feel the emotion that every pilgrim feel during Mass at the Cathedral and see fly the botafumeiro is the epitome of amazing spirituality that feels on the Camino. 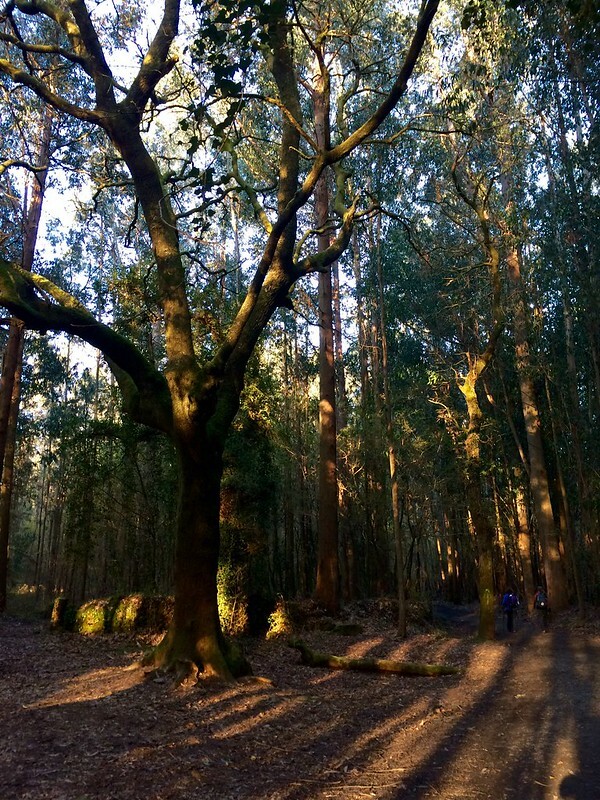 Keep enjoying your epilogue on the path to Finisterre, my friend! What an amazing journey that you shared with us. Thank you. I’ve been saving each post to read each day when I felt it was the right time to really savor your words, pictures and thoughts. I can actually smell the incense – by the way you described the Mass and your emotions today. And it warms my heart that Prince sang to you for miles on one of your only sunny days. 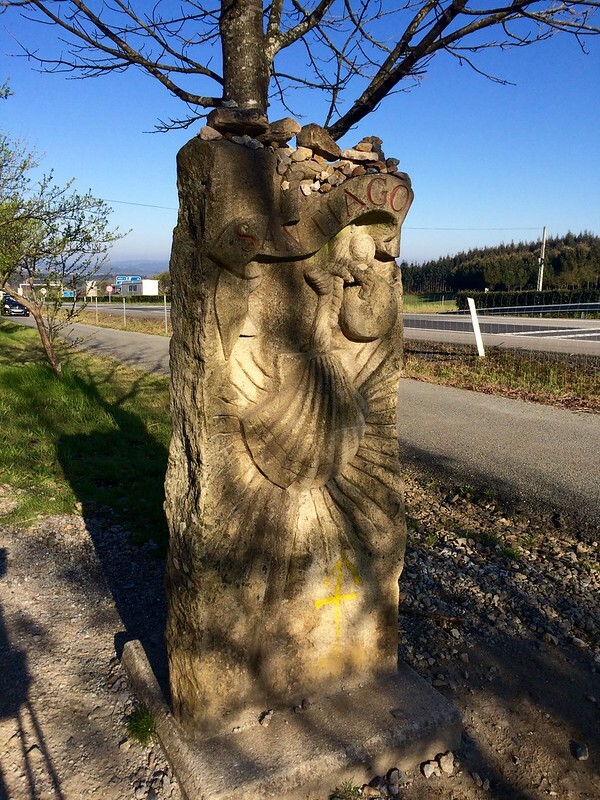 (Oh, I also love the photos, especially the details of things you see along the way – stones, markers, statues, a flower – so lovely!) May bushels of fresh veggies be in store for your consumption very soon! Lovely post. 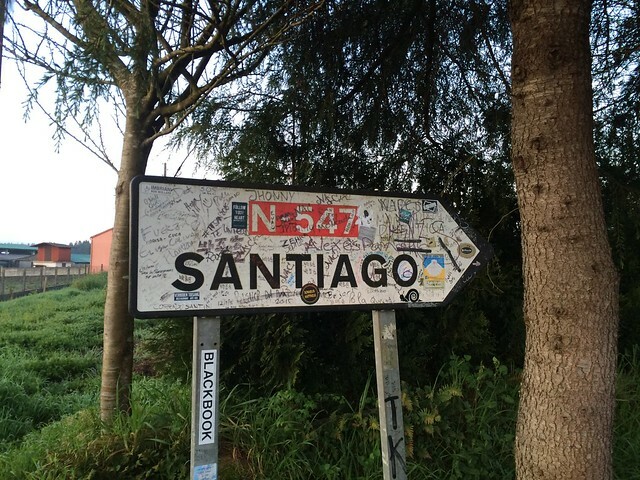 Congrats on making it to Santiago! Congratulations! I can’t decide whether I’m more impressed that you walked all that way or that you blogged about each day! Sounds like it’s been an awesome experience.